Sandakan is a city in the Malaysian state of Sabah, on the Northeastern Coast of Borneo. It’s a city that is often overlooked, with not many people knowing about it, but actually boasts amazing wildlife and a rich history of food. 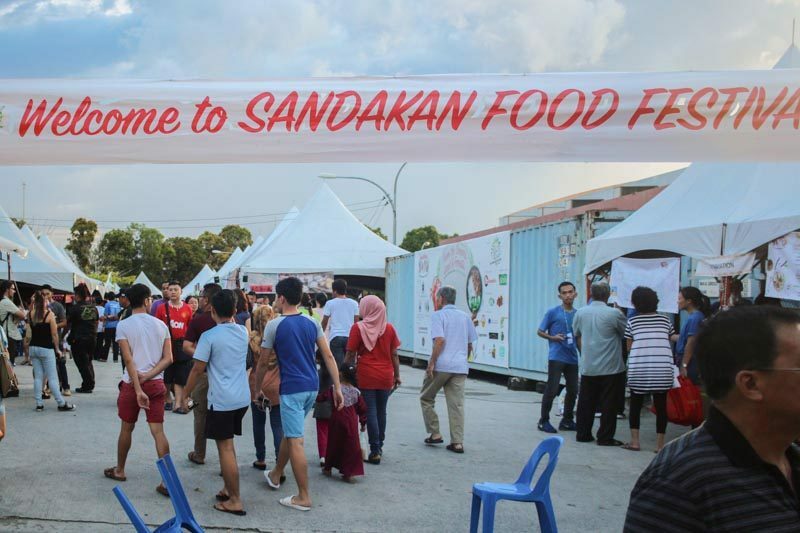 We had the privilege of being one of the few invited to the first ever five-day Sandakan Food Festival 2017 earlier this month where most of the vendors were homecooks, and we were amazed by the humble yet delicious food. Here’s a glimpse of what we had, so you can keep your eyes peeled for the next edition of this epic food festival. For a small city, the turnout at the food festival was amazing. Food ran out within the first hour on the first day of the event, so we had to return on one of the other days to be able to try all the famous local eats. 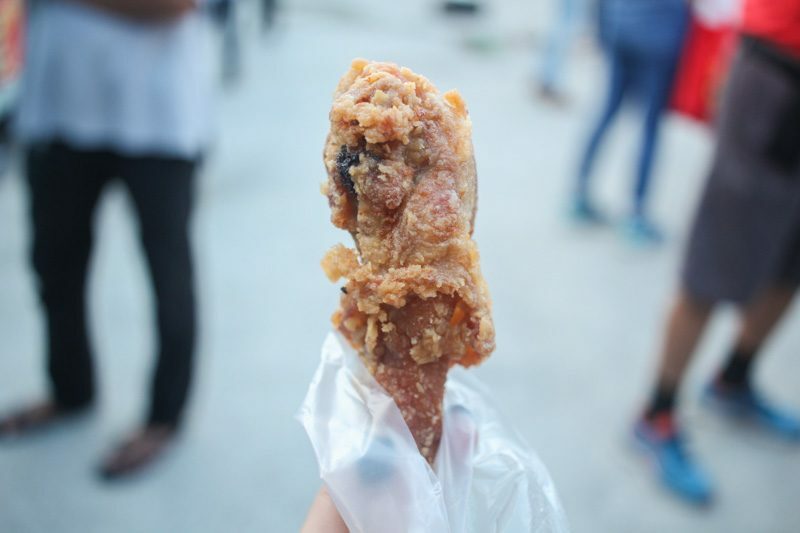 Not native to Sandakan but familiar to everyone, the smell of fried chicken immediately drew our attention. The chicken here is fried on the spot, and seasoned with a house blend of spices. It was fragrant and perfectly fried, crispy on the outside and juicy on the inside. We all agreed that it was one of the best pieces of fried chicken that we’ve ever had, and were dying to find out the ingredients of the spice blend that was used. 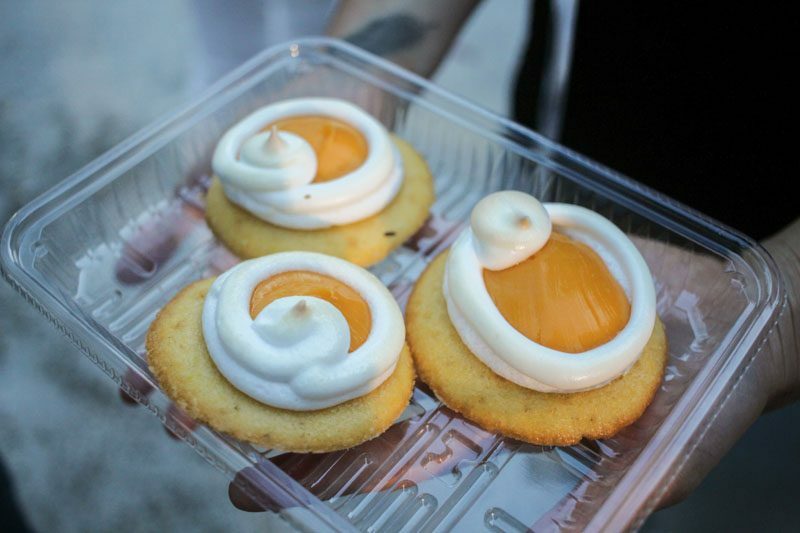 We then moved on to Sandakan’s most famous dessert – UFO tarts. The dessert/snack got its name because of how it looks like a UFO, but some people even call it Cow Dung Tart. No prizes for guessing why! It starts off with a Madeleine cake base that’s then topped with custard and slightly torched meringue. The Madeleine base was baked perfectly, with crispy edges and a spongy centre. The custard was not overly sweet, and the torched meringue was fluffy with a slightly crisp crust. A bite into this and we immediately knew why it was crowned the dessert of Sandakan. Like most other girls with a sweet tooth, cakes are my weakness and I couldn’t be happier to see these super pretty slices. The Mango Passionfruit Cheesecake Tart had layers of fresh mangoes, cream cheese, fresh cream, sponge cake and a very buttery tart base. 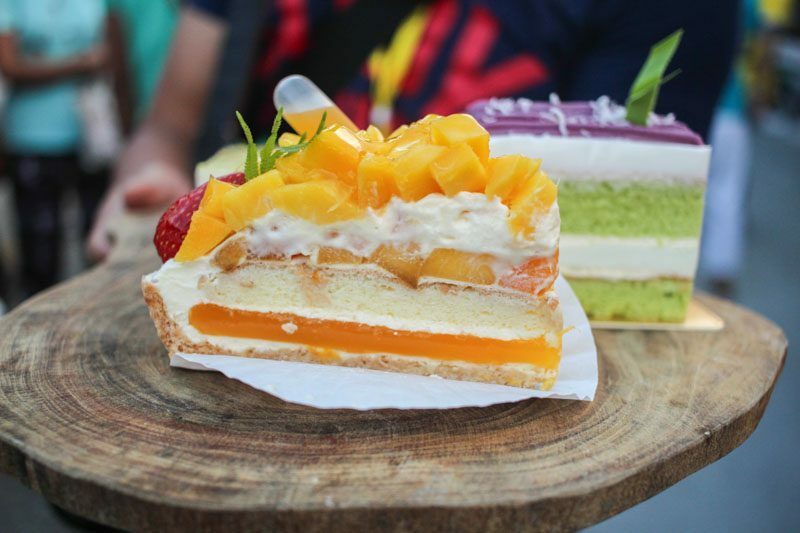 Sandakan’s weather is similar to Singapore’s, with an average temperature of 31 degrees celsius, and this light and tangy cake was perfect for the unforgiving weather. We also tried the 老夫子Lao Fu Zi (Left) and 贵妇人Gui Fu Ren (Right). 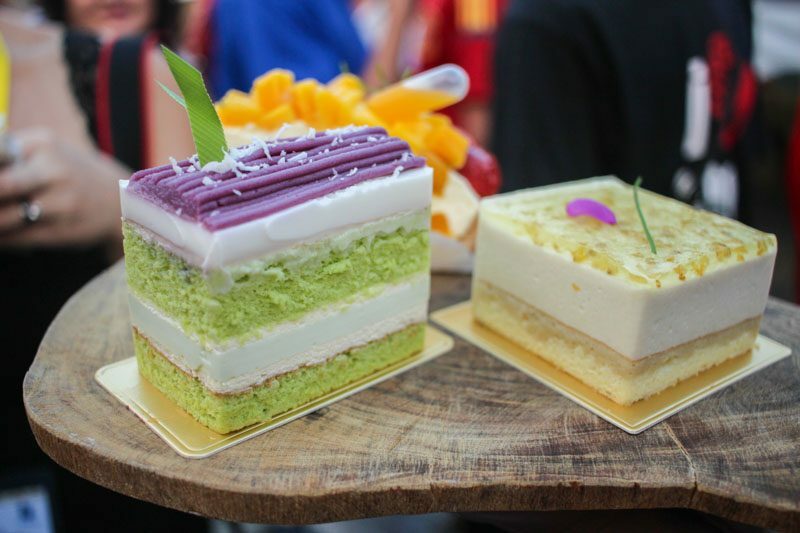 The 老夫子Lao Fu Zi is made up of pandan sponge, coconut jelly, and yam cream. This tasted very nyonya-ish, and was surprisingly light on the palate even though the flavours sound heavy. The 贵妇人Gui Fu Ren is an Osmanthus Tofu Cheesecake, with a very light tangy cheesecake layer sitting atop soft sponge cake, all topped off with a layer of Osmanthus jelly. This dessert is perfect for the health conscious, and the combination of tofu with Osmanthus will probably boost your complexion. The Baa Baa Black Sheep was a beautiful mess of boneless braised lamb shoulder chunks sautéed in coffee sauce, topped with homemade pickles and shredded cabbage, all snuggled in-between freshly-toasted brioche buns. 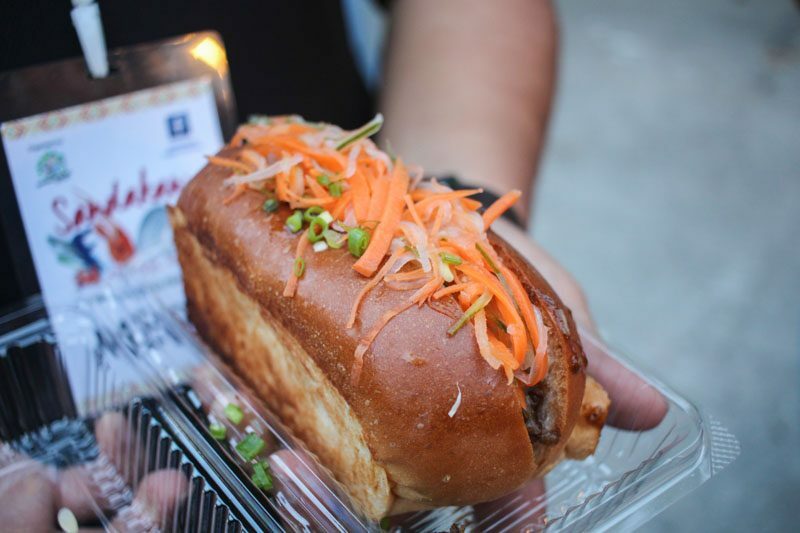 This sandwich tasted very similar to the Vietnamese Banh Mi because of the pickled vegetables. The lamb was tender and not gamey at all, but it was a slight pity that the coffee sauce was not as strong as we would have liked. We were pretty full by this point, but had to try this local Pork Burger. Although Sandakan is in Malaysia, most of the locals here are from the Chinese community, so pork dishes are very common. The waiting time for this particular dish was an average of two hours, until they sell out, and we were very lucky to have tried it. 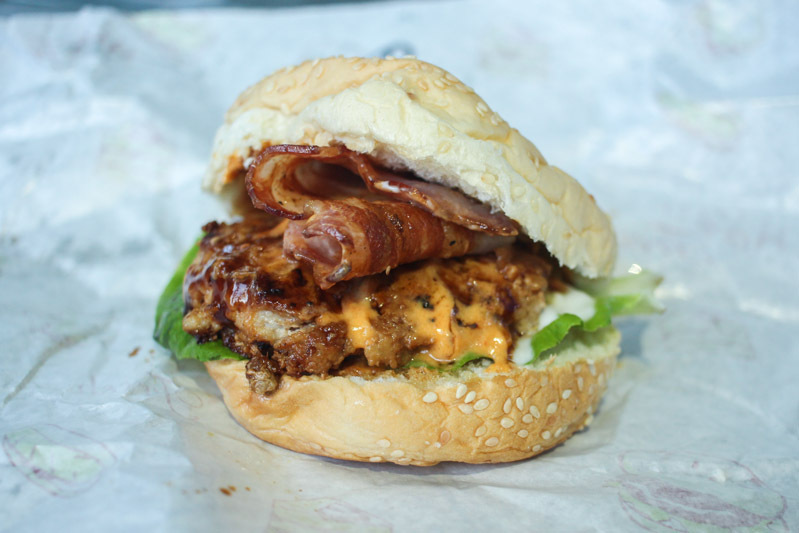 The patty is made up of minced pork that was incredibly juicy and fragrant, topped with a tangy homemade sauce and crispy bacon. Every component in the burger seemed ordinary, but the taste was indeed spectacular. Located along the coast, Sandakan is home to a whole plethora of seafood, and seafood dishes are extremely affordable. 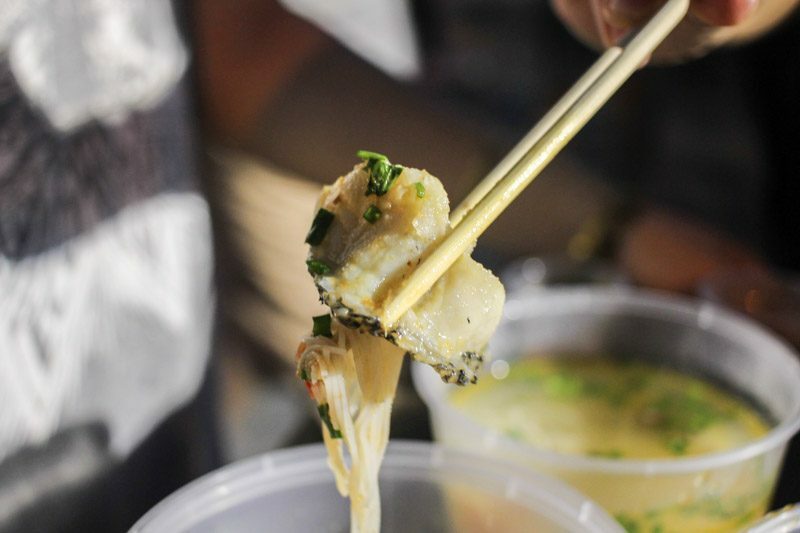 We had to try the Grouper Noodles. 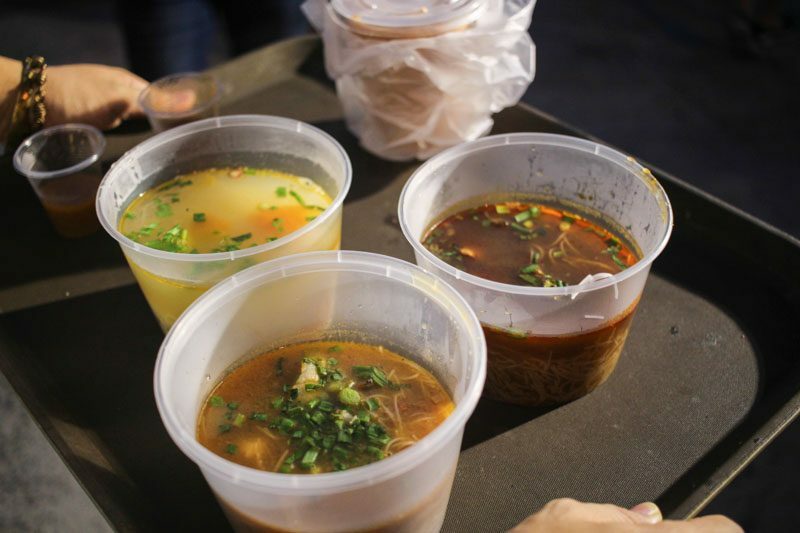 We had the Salted Veg Soup (Top left), the Tom Yum Soup (Top right), and the Assam Pedas Soup (Bottom). The Tom Yum Soup did not taste like the ones we were used to and was unfortunately a tad too bland. The Assam Pedas however, was a crowd favourite. The spicy and tangy broth really brought out the sweetness of the fresh grouper and well-cooked bee hoon. The fish slices were also very plump and fresh. They were cooked perfectly, tender but with a bite. I’m sure anyone who’s grown up in Singapore knows of the White Rabbit sweet. 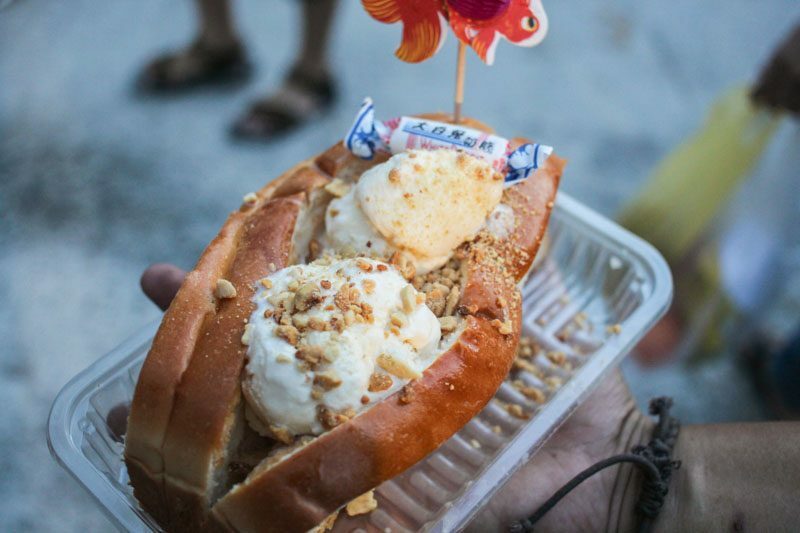 At the Sandakan Food Festival, the sweet was turned into ice cream – best idea ever? The custard that is used in the UFO tart mentioned above is slathered in between old school bakery buns, before two scoops of ice cream and crushed peanuts are added on top. The different textures were a plus point, but we hoped the ice cream would have had more of the candy taste that’s unique to the White Rabbit sweet. 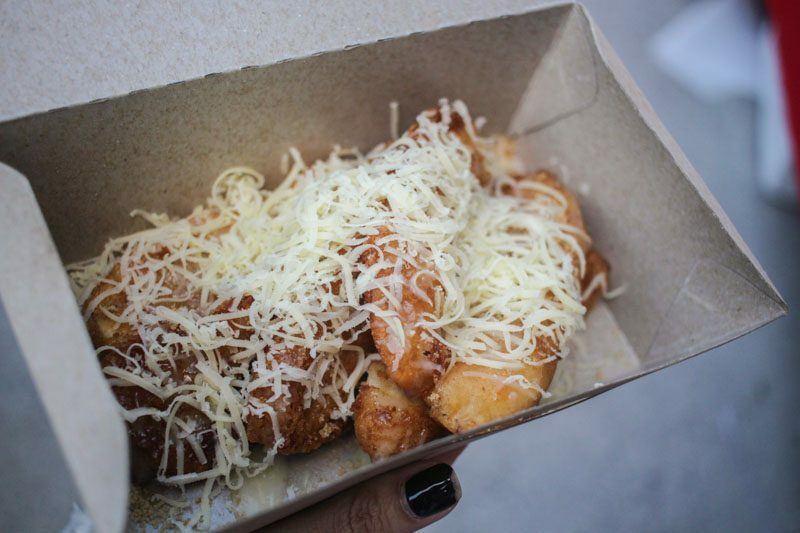 We were beyond stuffed, but couldn’t resist these Cheese Goreng Pisangs. 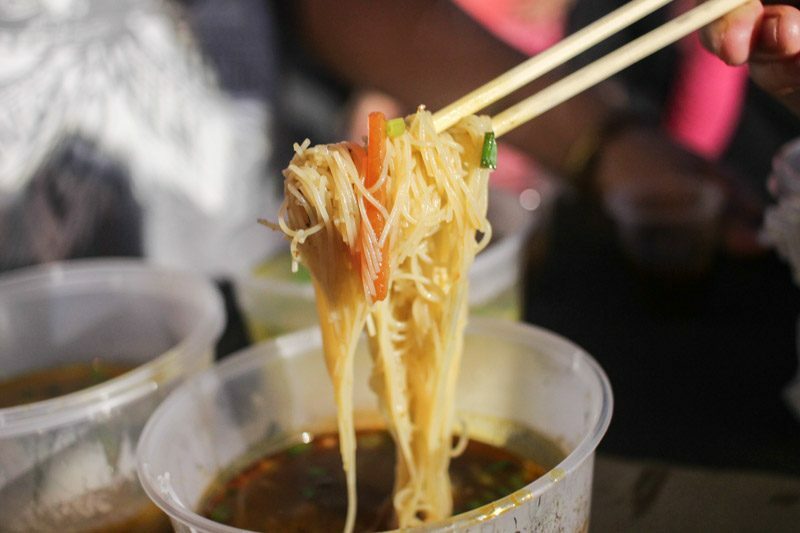 I know, I know, we have it in Singapore’s Pasar Malams (night markets) too. But the ones we had here were truly amazing. We think it must be down to the bananas – they were extremely fragrant. The bananas were fried in a batter that was crispy (and still remained so after a long time). A generous drizzle of condensed milk was given, before Gula Melaka powder was sprinkled over and cheddar cheese, grated. A single bite got us the perfect ratio of sweet bananas to salty cheese. It’s always amazing to see how homecooks are able to produce such high-quality food, as well as interesting twists to food that we are familiar with. It was definitely an eye-opening experience for me, and I would love to return to savour more of Sandakan’s famous local dishes. Apart from all the mouth-watering food, Sandakan is also home to incredible wildlife and nature. If you’re an adventurous person, make sure Sandakan is on your bucket list – you can stuff your face silly and then work all those calories off exploring the city’s natural beauty!